All Goldens descend from the same foundations originating in Scotland in 1868. Early descendants were crossed with a Tweed Water Spaniel which is now extinct, giving us the Golden Retriever we know today. Typical Retrievers are calm, and intelligent. They posses an exceptional eagerness to please. They have been popular as pets worldwide for decades. 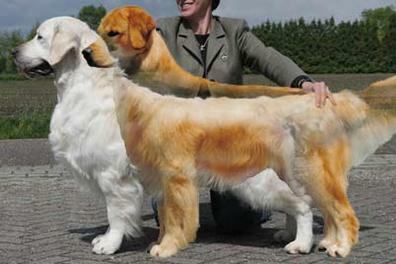 Over time, different countries have adapted their own idea of what a Golden should look like, their own “Breed Standard” to suit their own needs and taste. have darker variances on coat color Golden through red. Flatter coat on a longer, leaner build. Brown triangle shaped eyes and brown noses. Active and kindly disposition but not known for calm until grown fully. Of note, Cancer rates are higher in American Goldens. The current information shows 61.4% compared to 38.8% in English Golden’s.